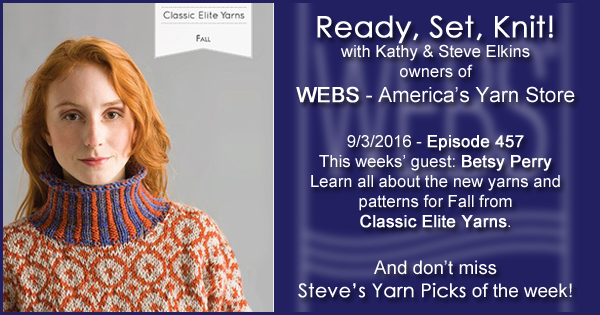 This week, Kathy talks with Betsy Perry, owner of Classic Elite Yarns! 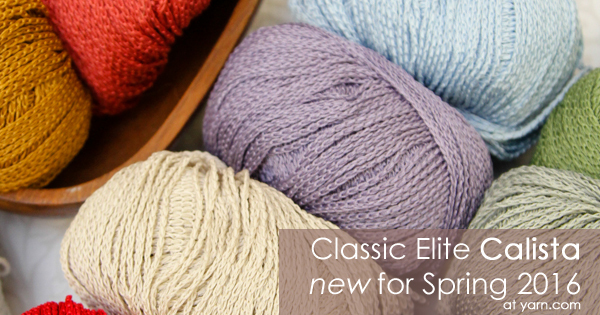 Hear all about Yuri, Mika, and Hanako – three brand new Classic Elite yarns for spring. With gorgeous colors, textures, and of course, new patterns from the designers at Classic Elite, these yarns can easily be incorporated into your spring wardrobe! 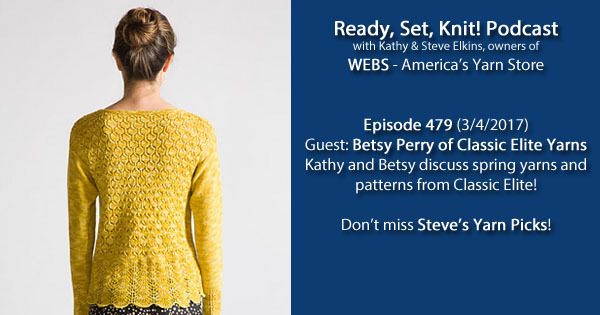 Also, catch up with Kathy and Steve as they recap their trip to Stitches West! 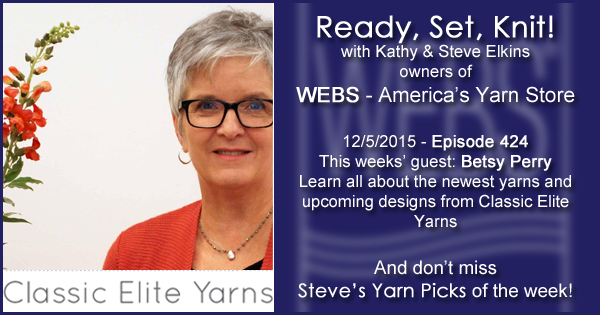 This week Kathy talks with Betsy Perry, owner of Classic Elite Yarns. 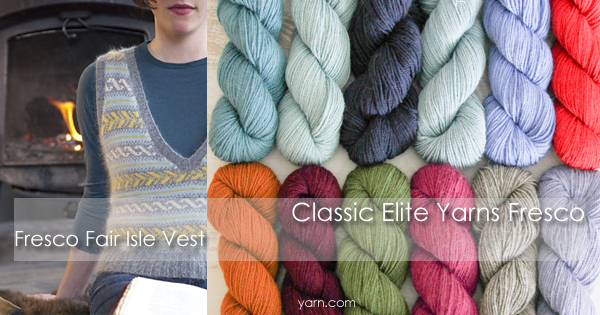 Check out all the new yarns for Fall and the fantastic pattern collections that accompany them. Adelaide, featured in the 1607 Adelaide Book. Look for the Bundeena Cardigan and the Licola Wrap. Arietta, featured in the 1608 Arietta Book. Look for the Hopewell Cardigan, and enjoy the FREE Arietta Cabled Hat. Wildwood, featured in the 1609 Wildwood & Mountaintop Book. look for the Bigelow Cardi and the Colvin Pullover. Palace, featured in the 1610 Fall Book. Look for the Hyppolyta cowl. And be sure to check out 1605 A time to Crochet, crochet collection! Valley Yarns has a Brand New yarn coming this Fall! We have partnered with Vickie Howell and you can see her announcement in her latest Ask Me Monday Facebook Live broadcast from this past week! Check out Valley Superwash Super Bulky today! WEBS IS closed on Monday, Labor Day, September 5th. Beginning Tuesday, September 6th, 2016, the retail store will be extending it’s hours until 6:00PM on Mondays, Tuesdays, Wednesdays and Fridays only. Thursday the store will remain open until 8pm, and Saturdays until 5:30. The newest yarn from Classic Elite, Calista, has amazing texture due to it’s construction, it’s actually a crocheted chain! This DK weight yarn is 100% mercerized cotton which gives it a lovely sheen, and is lightweight enough for beautiful summer garments. Think sweaters, tanks and wraps. Classic Elite Firefly has been with us for a few years but they’ve added some new colors for 2016. A wonderful blend of Viscose and linen, with a slightly nubby texture, Firefly works up into a fabric with a beautiful, glowing sheen and the drape is incredible too. There are plenty of sophisticated summer garments in the Wooded Glen Collection, perfect for showcasing this yarn’s unique features. There’s no better time to dream about, and plan for, those warm summer days. 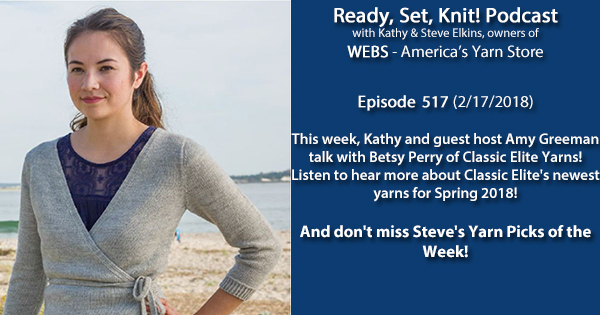 What warm weather knits do you have on your needles? I’ve celebrated “my” holiday, and now I’m sitting back and watching other people celebrate holidays. I guess we’re all counting down days til the New Year, and I’m very sure you’re getting tired of “10 Best” lists. I’m going to buck the trend and write a shortie about a thing I’m knitting just for me. 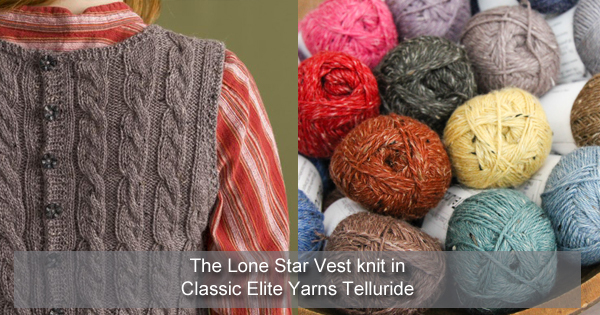 It’s been a while since I’ve picked up the needles for 1) a sweater, and 2) a sweater for me, but last week I cast on some Classic Elite Telluride in a heathery grayish-blue for the Lone Star vest. I’ve been stalking that garment for months, trying it on every once in a while and forcing other staff members to admire it on me. I finished up some gift knitting for the last of my knitting list and I decided It Was Time. I’ve knit a few inches of the front and I was gritting my teeth a bit at the linen content in this yarn (normally I just hate plant fibers), but the alpaca/donegal mix totally makes it worth your time. The linen gives it juuuuust enough structure to counteract the drapey tendencies of the alpaca. I want to point out to all readers that I made a gauge swatch, changed needle sizes a few times to get it exactly right, and then, my friends…I washed it and blocked it, and THEN measured my finished gauge. Just to be sure. Completely sure. I’ll keep you updated on the progress of this sweater; maybe a resolution for all of us could be to make a “selfish” project every once in a while to keep our mojo intact. Happy holidays to everyone! I went downtown today to run an errand, and what did I see? Evergreen garland being put up on several storefronts and lightposts. It’s just too soon! Every year, I kick about this and nobody listens. If we’re going to front-load the holiday season, at least let us have beautiful knits to make our holiday crafting better. 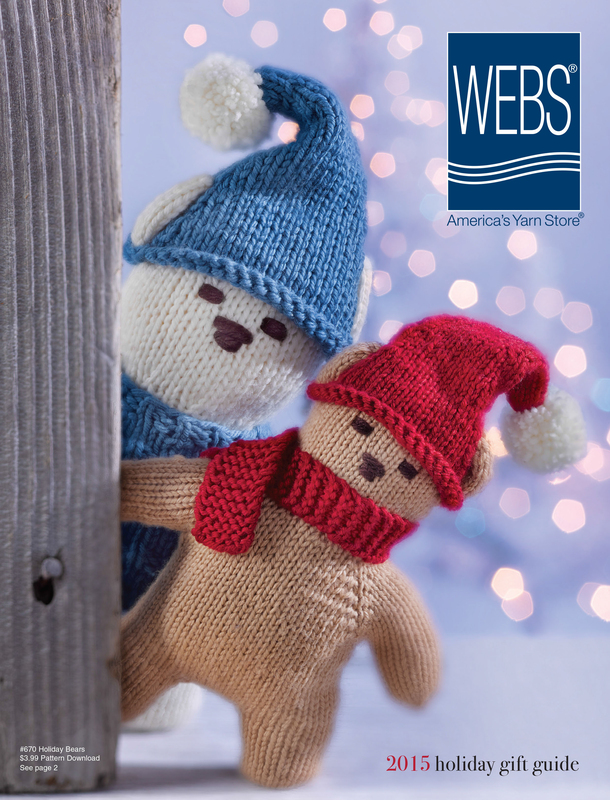 I got a fun email from our friend Kristin Nicholas with the news that Yankee Magazine, the bible of New Englanders, is featuring some of her holiday patterns as well as the cutest video of her Pom Pom Garlands. This is a craft that can be done by anyone with the dexterity of a 3-year-old with the Clover Pom Pom makers sold in our store. Her Pom Poms are characteristically Kristin, made with her striking color choices. I always try to point folks making Christmas stockings to Kristin’s Creative Christmas Stockings pattern, available in PDF form. The colors are not what you’d call “Christmas-sy” but to me, that makes them way more appealing. The bright contrasts are as joyful as the spirit of the holidays; and aren’t you all getting a wee bit tired of red, green, blue, and white? Yankee magazine is also featuring Kristin’s Heart to Heart Mittens, which we carry in PDF as well. The word “happy” doesn’t begin to cover how these fun mittens make one feel. Not only does the pattern give you two options, one for one heart, one for many hearts, but Kristin’s clear directions even show the knitter how to embroider the accents onto the mittens before the top is closed, making them even easier to knit. 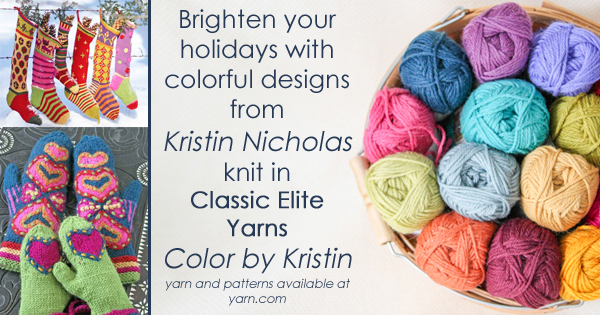 If all holiday designs could be knit in Color By Kristin yarn, I’d be much less Grinchly. What makes your holiday knitting happier? 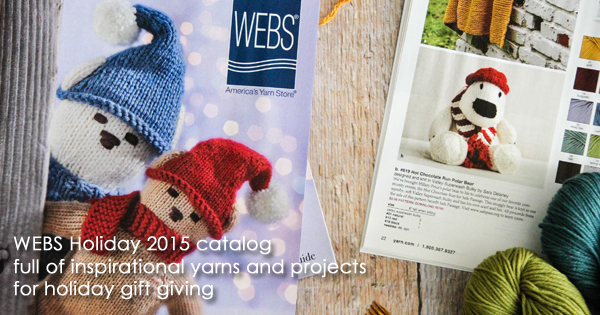 WEBS Fall 2015 Catalog is here! Our Fall 2015 Catalog might be my favorite this year. 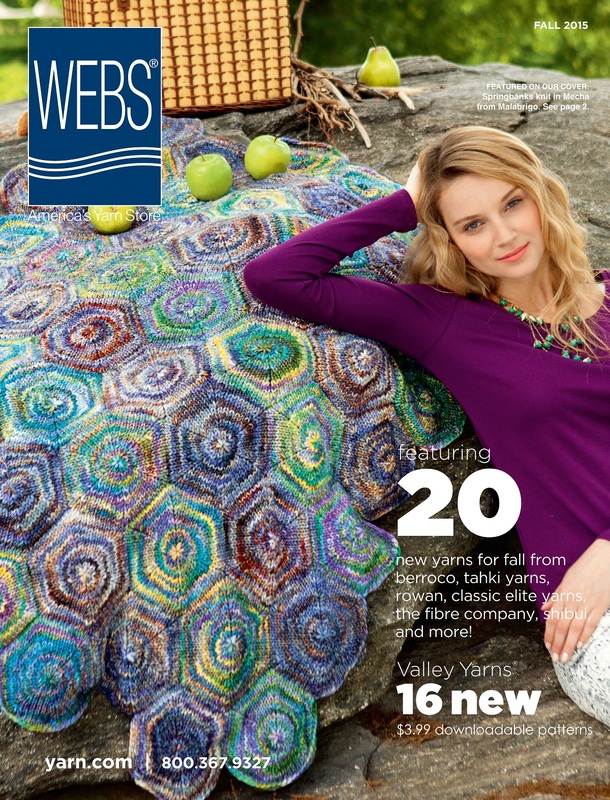 We’ve featured Malabrigo Mecha on the cover in the gorgeous Springbanks Blanket from Malabrigo Book 8. 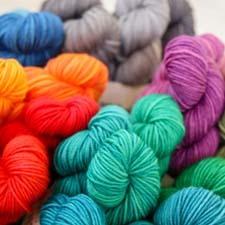 Inside you’ll find lots of new Fall yarns from Rowan, Shibui and the Fibre Company. 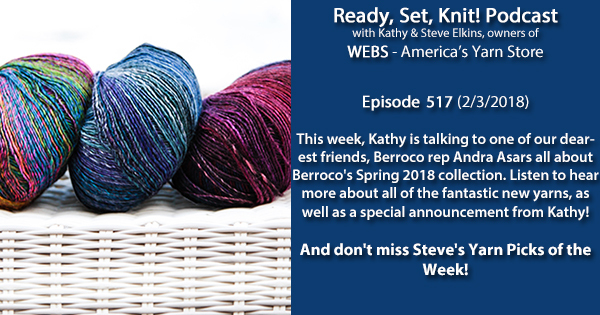 New patterns from Debbie Bliss, Jo Sharp and Stacy Charles Fine Yarns, and all the needles and hooks you’ll need to get going on your holiday knitting. So check your mailbox (sign up to receive the catalog here), or browse online, and see what’s hiding in those 64 pages that will inspire you this Fall!